Like most Americans, most of the people in the U.K. love their cats. Larry is just one of 100,000 cats working in service to the Crown to keep down the mouse population in government buildings. It seems like quite the old fashioned approach, but definitely a green one, and a cuddly one. Larry and another cat, Humphrey, are the only two to have been given this title officially. The chief mouser does not belong to the Prime Minister and will stay on through the terms of whoever comes and goes in the office. The longest term mouser at #10 was Wilberforce who held the post for an amazing 18 years. His term ended while Margaret Thatcher was in office. This month Larry will celebrate his third anniversary in residence at #10. There had been a gap where there was no mouser with no plans to fill it with another cat before Larry took up the post. Between a strong pro-feline sentiment among the humans at #10 and the sighting of rats, the tide shifted back towards keeping a cat. The Downing Street Staff selected Larry to fill the post. 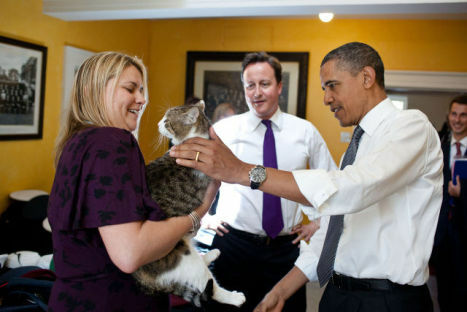 David Cameron introduces Larry to barack Obama (Photo cy Pete Souza, White House Photographer/Creative Commons via Wikimedia)Larry is a rescue cat who came to #10 via the Battersea Dogs and Cats Home. According to Prime Minister David Cameron, Larry tends to be nervous around men -- with one notable exception, U.S. President Barack Obama. Larry's installment in #10 digs has caused a 15% rise in cat adoptions at the home. Unlike his predecessors, Larry's upkeep is not funded with taxpayer money. The staff of #10 pays for his needs themselves. In return he reputed to be a good mouser and definitely earns his keep by keeping down the rodent population. He was noted to have made his first kill, a mouse, on April 27, 2011. "Larry spends his days greeting guests to the house, inspecting security defenses, and testing antique furniture for napping quality," says the cat's press officer. "He has captured the hearts of the Great British public and the press teams often camp outside the front door. 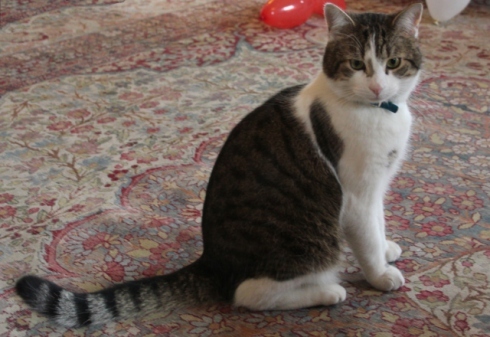 In turn the nation sends him gifts and treats daily,"
In 2012 a second cat was added to #10 in the form of Freya, the cat owned by the Chancellor of the Exchequer George Osborne. She now shares the title and the duties with Larry. It is said that they have established a cordial relationship, though it has also been reported that they have gotten into at least one fight that had to be broken up by police. If you are really curious, you can check out #10 Downing Street on Google Maps Street View and you will find Larry hanging out near the door. Narcoleptic Kitten -- The Sleepy Animal Video of the Day!!! Tiger and Dogs Playing Together! The Animal Video of the Day!! !